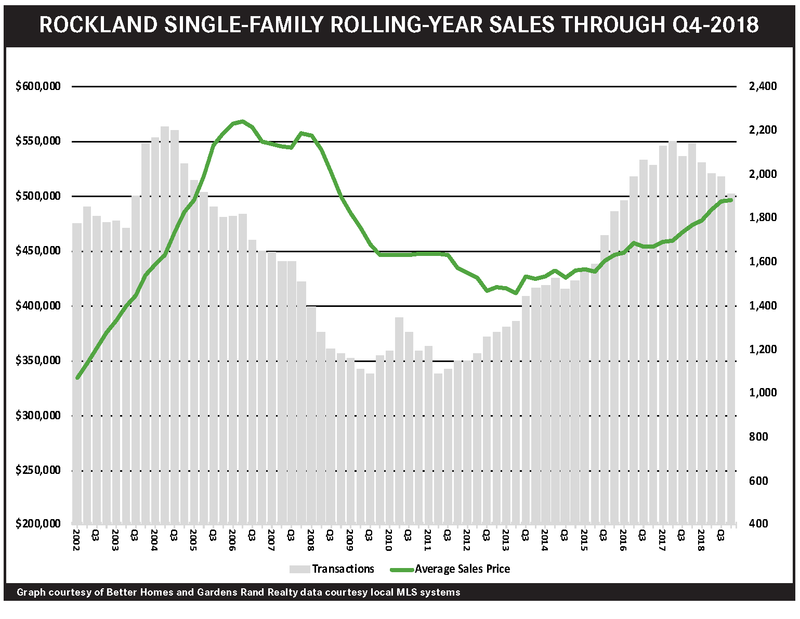 The Rockland seller’s market continues to be constricted by low levels of inventory, which are holding back sales, even while driving prices up. Single‑family home sales were down sharply in the fourth quarter, falling almost 14%, finishing a full year in which they fell almost 11%. But prices were up, rising a tick on average and almost 3% at the median, closing a year in which pricing rose 5% on average and almost 5% at the median. We see the same story with condos, with sales down and prices up for the quarter. So what’s going on? Basically, Rockland needs more fuel for the fire. Demand is strong, but supply is too low to sustain sales increases, even while too many buyers chasing too few homes is driving prices up across the board. But that might be changing, with inventory starting to rise after years of falling, as home owners see prices going up and are tempted into the market. Going forward, we expect that demand will sustain meaningful price appreciation through the winter and spring markets, and that increased inventory might help boost sales as well. To learn more about Better Homes and Gardens Real Estate Rand Realty, visit their website and Facebook page, and make sure to “Like” their page. You can also follow them on Twitter, Pinterest, and Instagram.